German Foreign Minister Sigmar Gabriel announced Thursday a range of steps to be taken against Turkey in response to the detention of Peter Steudtner, who is accused of terrorism charges by Turkish authorities but is described as a human rights activist by the German government. His statements signal a more confrontational stance to the NATO ally after escalation in tensions. Gabriel, a day after his ministry summoned Turkish ambassador, said Germany would talk to EU partners about Turkey's aspirations to join the bloc and made clear Berlin could no longer guarantee German corporate investment in Turkey. "We need our policies toward Turkey to go in a new direction ... we can't continue as we have done until now. We need to be clearer than we have been until now so those responsible in Ankara understand that such policies are not without consequences," Gabriel told reporters. Social Democrat Gabriel said the new steps had been agreed with Christian Democrat Chancellor Angela Merkel. Shortly after, government spokesman Steffen Seibert tweeted: "Merkel: The measures announced by the Foreign Minister against Turkey are necessary and unavoidable." Gabriel said Germany had revised its travel advice in the wake of the recent arrests including German national Peter Steudtner. Bookings from Germany account for around 15 percent of Turkey's tourists. Steudtner "was no Turkey expert - he never wrote about Turkey, he had no contacts in the political establishment ... and never appeared as a critic," Gabriel told reporters. In response to the controversy surrounding Turkey-Germany relations, Turkey's Presidential Spokesperson Ibrahim Kalın urged Germany to use common sense. "It is not acceptable for Germany to cast shadow on economic relations with Turkey over small political calculations, approaching elections" Kalın said, criticizing the country for "great political irresponsibility" which resulted in the escalation of a recent row. Ten suspects, including Steudtner, Swedish national Ali Gharavi and Amnesty International Turkey director İdil Eser, were detained after Turkish police raided a meeting held at a hotel on the island of Büyükada, across the shore from Istanbul, for allegedly planning provocative events that would fuel unrest across Turkey, similar to the notorious Gezi Park riots in 2013. Six suspects were arrested on terrorism charges, while four suspects were released under judicial control. In addition to Germany, the arrests prompted reactions from the U.S. and Sweden. Earlier in the day, Turkey's Foreign Ministry criticized recent statements by German government spokesperson regarding the arrests, saying that interference in Turkish judiciary is unacceptable. German-Turkish journalist Deniz Yücel of Die Welt daily was arrested on on similar charges with Steudtner in February, prompting reactions from Germany. 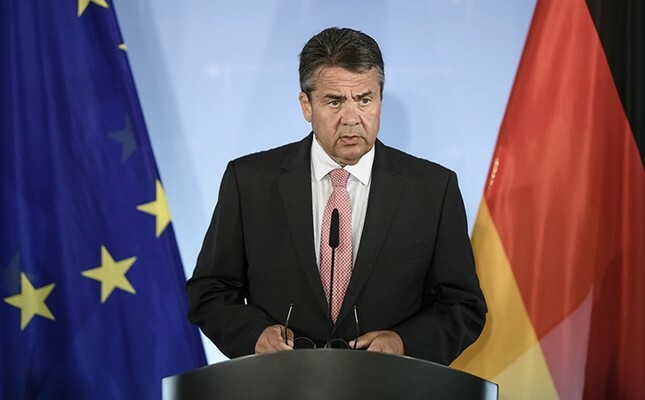 Gabriel, who returned to Berlin from a holiday to deal with the incident, said that he would work with Chancellor Angela Merkel and European Union officials to decide on other sanctions against Turkey. The measures being considered include withdrawing export guarantees and pre-accession funding to Turkey from the EU, Gabriel said. On Wednesday the newspaper Die Zeit reported that Turkish authorities had several weeks ago handed Berlin a list of 68 German companies, including Mercedes owner Daimler AG and BASF, they accused of having links to Gülenist Terror Group (FETÖ) leader Fetullah Gülen. The claims were dismissed as "absurd" by German security sources. Gabriel, without referring to those claims, said that "you can't advise someone to invest in a country where there is no legal certainty and even completely innocent companies are linked to terrorism." In a message posted on his Twitter account, Deputy Prime Minister Responsible for the Economy Mehmet Şimşek dismissed reports claiming that Turkey is investigating German firms for alleged terror support. Local media reported Thursday that Ankara had suggested swapping German nationals being held in Turkey for Turks it suspects of supporting last year's failed coup attempt that were subsequently granted asylum in Germany. "There is no official offer of a swap," Gabriel said. "There has been no correspondence and no phone call" in which such a swap was suggested, he added. Relations between Turkey and Germany, home to three million ethnic Turks, have been badly strained, particularly since the failed coup attempt a year ago against Turkey's democratically elected government by the Gülenist Terror Group (FETÖ). Turkey accuses Germany of harboring high-ranking FETÖ figures and soldiers linked to the coup attempt, in addition to activities of PKK and DHKP-C terrorist groups in Germany. The two countries were also involved in a bitter diplomatic spat over German parliament's bill describing 1915 events as "genocide" and Turkey's counter measure of preventing German lawmakers to visit German anti-Daesh troops deployed at the Incirlik base. Germany pulled out its 260 military personnel and fighters from Turkey in June, and redeployed them in Jordan. The spat has also cast clouds over a 2016 deal between Ankara and the EU that has stemmed the mass influx of migrants and refugees into the block.